Smoothies are not a new way of eating however trendy they may feel. Blended drinks have been a staple for years, but the recent conscious living movement has propelled them to the next level as they are now often considered a meal. Lots of controversies in the public regarding movements like vegan, Paleo and such. Many claiming these types of conscious living movements are eating disorders in disguise or the new form of anorexia. Eating fermented foods often accused as being a sign of unhealthy eating habits. The thought of having a smoothie consisting of fresh vegetables, healthy fat and water not representing a healthy replacement is ridiculous. Yet big business continues to have the majority of consumers believe that replacing a meal with a smoothie is not a healthy way of eating. In fact research and study after study show that eating clean raw vegetables and fat throughout your day provides the nutrients most of our bodies need to function optimally. Each movement offering study after study, miracle stories in the multiples and successes often beyond comprehension that when people give up processed and chemical ridden foods and begin replacing them with good fat, organic fruits and vegetables combined with protein there bodies typically lose signs of many autoimmune disorders, diabetes, psychological struggles and personality issues. Regardless of your diet preference for many of have us consuming the amount of vegetables needed for proper nutrition can present a challenge for our taste buds and our ability to consume such a quantity in our busy lives is also an issue. Smoothies offer the perfect alternative to chewing and cooking to get your daily dose of veggies in. 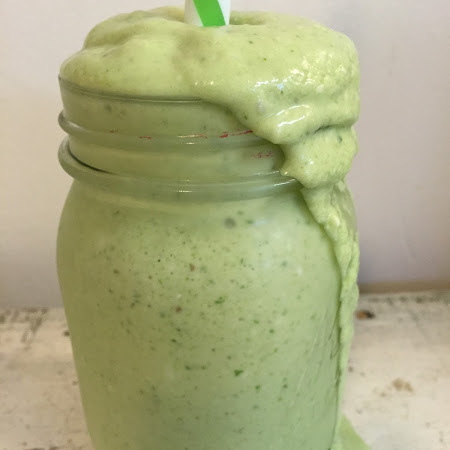 The good news is that a good smoothie recipe is often universally delicious, easy on the eyes and can serve as a replacement to “fun food” like the famous chemical ridden, high sugar content, shamrock shake from our friends at McDonald's. Nothing represents American culture more than the Shamrock Shake and McDonald's. Products made in America are rare and often some of the finest craftsmanship available in the world. The Waring Pro blender is one of those products. From the moment you lift up the box you're aware of the power this equipment offers. The Waring Pro blender is series about the art of blending. The beveled glass pitcher is beautiful offering craftsmanship unmatched. Today almost all blenders offer plastic manufactured tops weighting in at a few pounds. These blenders are often unable to withstand long-term use and/or making anything smooth. The Waring Pro blender should be called the Sturdy Pro blender. From the base to the top of this blender there is no question the Waring pro blender means business. Many smoothie recipes include frozen fruits or ice cubes to give them that frothy thick consistency many of us love. The Waring Pro blender is built to chop & cream for that perfect smoothie every time. The Waring Pro blender offers 2 speeds allowing you to be the master of your smoothie destiny. For many recipes the optimal palatable outcome seldom is achieved using one temperature or speed. The Waring Pro lets you to define the speed with the flip a switch. Many of the fluffiest cake, batter and pudding recipes call for a two speed approach and the Waring Pro has you covered for all of your fluffy, creamy, smoothie needs. Dairy and sugar free smoothies are a rare combination and yet a welcome alternative for many of us, especially those following a ketogenic lifestyle. This ageless and timeless classic honors the kid in all of us while paying tribute to the conscious eater in all of us. The Waring pro delivers a Paleo perfect smoothie that is guaranteed to make any shamrock shake person proud.